Although the 7 year run of the hit TV series Star Trek: Voyager has recently come to an end, fans of the sci-fi drama can continue to relive the adventures of Captain Janeway and her stranded starship crew through their own home computers with Activision’s latest release, Star Trek: Elite Force Expansion Pack. Building upon one of the greatest Trek games of all time, the expansion pack for last years release, Elite Force, adds some new surprises, adventure, and fun to those PC gamers that are still caught in the throws of Voyager withdraw, now that the popular TV series has entered the annals of time. Game developers Raven Software and longtime publisher Activision stumbled onto a winning title last year with the release Star Trek: Elite Force. 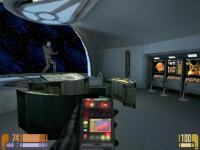 Although trek titles had been a ‘hit-or-miss’ scenario for quite some time in the gaming world, Raven was able to capture the essence of the Star Trek franchise by creating a game that completely felt like a Star Trek: Voyager TV episode (you can read our full review of Elite Force at http:/www.the-laser.com/startrekef.htm). Utilizing the Quake III engine, Raven and Activision put the gamer on a true 1st person Star Trek adventure that has yet to be matched by another game. With the release of the Expansion Pack for EF fans can add a few more cherished Voyager moments to their game playing time, and squeeze some more life out of their copies of Elite Force. The expansion pack for Elite Force adds the usual baubles and trinkets that we’re used to seeing in the PC gaming world for similar genre’s and titles. That is, it has just enough additions to it to make the upgrade worth shelling out the MSRP of $19.99 for, but in the end could use a little something more that what it came with. Kudos does go out to the design team, however, for the work on the expansion pack was highly polished, and did not give the appearance of a product that was shoddily thrown together in order to make a quick buck…a problem with other expansion products in the past (that was also something to think about, seeing how the TV show Voyager came to the end of its 7-year run right around the same time as this products release). EF’s expansion pack contains about three major upgrades to the original game, for both the single and multiplayer modes. Hands down, the most comprehensive of these new additions is the interactive tour mode, which gives the player almost full access to roughly 10 decks of the starship Voyager. Integrated within the tour are minor challenges (not unlike the ones found with the game play of the original single player version) that give the player and reason to scour the ship for clues, resources, and items. All of the well known locations found on the TV show are accessible, including the bridge, mess hall, engineering, astrometrics, the shuttlebay, the transporter room, sickbay, and even the officers quarters. Once again, the Holodeck is available for use on the interactive tour, which in reality happens to be the access point for the new ‘single-player’ missions. Anyone familiar with the holodeck trainings sims that were available on the original EF release will find the access rather similar. This time around, you have four new sim challenges to engage in, including a target/gunnery range (a la Star Trek: TNG), a romp through the Starfleet Academy gardens (watch out for the gardener, though…he’s tougher than he appears to be), an assault on a Klingon stronghold, and even a campy run through one of Tom Paris’ Captain Proton episodes (this reviewers personal favorite, actually). Just like the original holodeck missions, the new ones have multiple challenge levels that substantially change the speed of the action. The multiplayer aspects of EF have been greatly improved upon with the release of the expansion pack, giving those bitten by the frag-bug something to cheer about. Found on the disc are 21 new multiplayer maps, including 7 holomatch locations, 9 CTF maps, and even 5 fan created maps. There are also 5 new game modes to battle with, including a disintegration mode where you vaporize enemies with one shot from the compression rifles, and an assimilation game, where you must ‘borg-ify’ as many people as you can before the timer runs out. Add to that a slew of new character skins to use during game play (including a Borg-ed out Captain Janeway and the cast of Captain Proton) and the fragfest can continue unabated for hours on end. 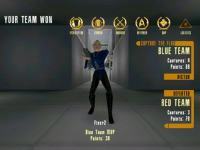 All in all, the Elite Force expansion pack was an entertaining addition to an already great game. Being able to freely wander the halls was quite entertaining, not to mention the fun little discoveries that one can make while making his or her way around the Starship Voyager. The single player games were interesting and fun as well, but lacked the intensity and longevity of the original single player story, and could have been expanded upon greatly in order to be considered a ‘real’ single player mission. The real gem for this game happened to be the multiplayer additions that were not only entertaining, but a welcome addition for those that have grown tired of searching the web for new and exciting maps. Once again, Raven and Activision have created a product worthy of the Trek franchise.